Nearly 700 million people worldwide do not have access to clean drinking water  according to the World Health Organization (WHO) and UNICEF’s 2015 Progress on Sanitation and Drinking Water report. The issue of poor water quality is starting to return to the developed world as well. Intensified agricultural practices, the strain of population growth and continual industrial expansion are all contributing to the growing contamination levels in water supplies. Most of this contamination comes from Chlorinated Aromatic Hydrocarbons (CHCs) and Chlorinated Aliphatic Hydrocarbons. These contaminants are lethal and carcinogenic, and are typically found in environmental water samples. CHCs are used widely in a broad range of industrial processes, as paint strippers, chemical extractants, and in the manufacturing of oils, adhesives, solvents lubricants and more. Despite increasing opposition to the use of CHCs and the development of practical, eco-friendly alternatives, CHC use continues to be widespread. CHCs create a serious threat to human health and the ecosystem. Long chain CHCs are especially harmful, because of their persistence in water, and their tendency to develop films on the water’s surface. These films can prevent oxygen from entering the water, causing the suffocation of aquatic life. Measuring the pollution levels in water so as to control CHC levels is important to protecting environmental and human health. Governments worldwide are seeking quick, reliable and inexpensive techniques to measure water pollution levels. When examining CHC levels in water, the challenge is to use an ideal liquid-liquid extraction technique, to remove the water itself which would hinder with the measurement, with an environmentally friendly solvent. This makes it possible to quantitate hydrocarbons rapidly and safely. Fourier Transform Infrared Spectroscopy (FT-IR) is a proven technique for identification and quantification of hydrocarbons. Every different CHC has its own infrared fingerprint which can be identified with the aid of infrared spectroscopy. Once identified, the quantity of infrared absorption can be used to establish the concentration of each CHC in a sample. FT-IR spectroscopy was traditionally used to measure the grease and oil leached into water during offshore oil operations. However, the halogenated solvents that the FT-IR technique used were sources of ozone-depleting chemicals, and so they were thought to be unsafe. This led to a transitory decrease in the use of FT-IR. However, the advantages of FT-IR based techniques such as its simplicity, sensitivity and non-destructive nature caused Researchers to develop new, environmentally friendly FT-IR based techniques of CHC measurement which made use of non-halogenated solvents. However, selecting the right FT-IR model for hydrocarbon analysis continues to be a challenge. The perfect system should have a small footprint, so it is not limited to work in research laboratories. It should provide quick measurements, as well as repeatability and high accuracy. The model should be user friendly and provide a number of path-lengths for better versatility. Attenuated total reflectance (ATR) FTIR – was used to examine CHCs in water . Various CHCs were discriminated against and detected, including 1,2-dichlorobenzene, monochlorobenzene, perchloroethylene, trichloroethylene, 1,3-dichlorobenzene, and chloroform. The Authors determine that ATR-FTIR has major potential as a future technique of measuring CHC levels in contaminated water. This research showed that FT-IR can detect CHCs in concentrations as low as parts-per-billion (ppb) and that all the CHCs present can be measured in a single step. 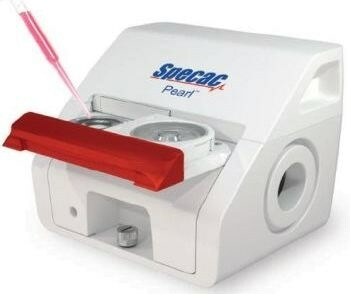 Specac’s Pearl™ Liquid Analyzer is a high specification liquid transmission accessory, which is perfect for measuring hydrocarbon pollutants in water. It is the ideal choice for any application that requires liquid analysis as it offers a quicker, more accurate and more repeatable analysis compared to traditional liquid cells. It is also very easy to use. The Pearl™ Liquid Analyzer can be fitted with CaF2 or ZnSe windows, which can be interchanged within seconds. The liquid transmission Oyster™ cells in the Pearl™ Liquid Analyzer are available in five path-lengths; 50 µm, 100 µm, 200 µm, 500 µm and 1,000 µm, which enables the simple calculation of sample concentrations without the requirement for a calibration curve or dilutions.